Committed to our customers, Four Seasons Grass provides high quality artificial turf, professional installation and service with a smile. We ensure our customers make informed decisions about high standard synthetic grass. There are many advantages offered with our high standard synthetic grass products, including the appearance of natural grass; without the watering, fertilizing, or mowing! 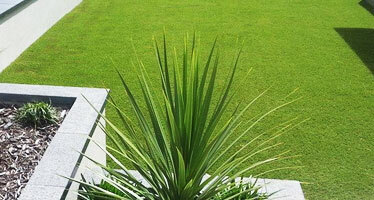 Achieve the look of well watered grass all year round! At Four Seasons Grass, our dedicated team will help you make an informed decision regarding the various options of synthetic turf available. Use it anywhere! Around swimming pools, spas, balconies, front or backyards; the list is endless! For all retic and planting, The Paving Blokes highly recommend the use of Botanic Landscapes! You can contact them by just filling in the form below, we will only recommend reliable companies. 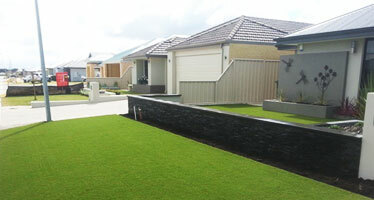 Our high standard synthetic grass products give the appearance of natural grass. Save water during the summer months with the latest in Synthetic Turf. It can be used around swimming pools, spas, front and backyards, courtyards & balconies, Save money with Four Seasons Grass! Synthetic grass is a must for commercial projects, where maintenance, lack of water, shade and high traffic are concerns. 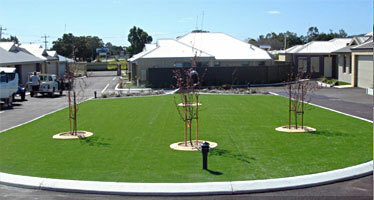 At Four Seasons we install synthetic grass in parks, playgrounds & retirement villages. Need paving, fencing, coping? What about edging or bullnosing around the pool area? Look no further than Four Seasons Grass! We can advise you on all options available regarding colours, Paver styles and sizes.